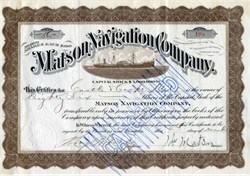 Beautiful certificate from the Matson Navigation Company printed in 1916. This historic document was printed by the Union Litho Company and has an ornate border around it with a vignette of a ship. This item has the original signatures of the Company’s President, and Secretary, and is over 96 years old. The certificate was issued to Castle and Cooke, Ltd. and was endorsed on the back by Castle and Cooke's President, Edward Davies Tenney and Treasurer, Cha. G. Joe Atherton as well as William Matson . Captain William Matson was born in Lysekil, Sweden, in 1849 and orphaned during childhood. Matson took to the sea early, getting his first ship job as a "handy boy" at age 10. By 21, Matson was captain of a schooner running between San Francisco and the Puget Sound area. In 1882 he bought his own ship, the Emma Claudina, a three-masted schooner. That ship's first 18-day voyage from San Francisco to Hilo Bay marked the genesis of Matson Navigation Co., a shipping line still thriving today. In 1887, Matson sold the Emma Claudina and bought the bigger Lurline, named for his daughter. This ship and others were used to transport sugar, canned pineapple and, later, passengers. Matson kept up with technological innovations as he built up his fleet. His bark Rhoderick Dhu had a cold-storage plant and electric lights. His ships were among the first in the Pacific equipped with radio telegraphs. His first steamship, the Enterprise, was converted into one of the first offshore ships to burn oil instead of coal. The second, the Lurline, a steamer built in 1908, had accommodations for 51 passengers due to increased interest in Hawaii as a tourist destination. A need for fuel oil led to Matson's interest in oil production. "If you use fuel in large quantities, you must control the source of it," he said. In 1901 he organized the Western Union Oil Co. and built the first California pipelines to stretch from wells to coast shipping points. In 1910 he organized the Honolulu Consolidated Oil Co. and was instrumental in convincing sugar plantation owners to switch to fuel oil for their irrigation pump and mill requirements. Matson Navigation Company's long association with Hawaii began in 1882, when Captain William Matson sailed his three-masted schooner Emma Claudina from San Francisco to Hilo, Hawaii, carrying 300 tons of food, plantation supplies and general merchandise. That voyage launched a company that has been involved in such diversified interests as oil exploration, hotels and tourism, military service during two world wars and even briefly, the airline business. Matson's primary interest throughout, however, has been carrying freight between the Pacific Coast and Hawaii. In 1887, Captain Matson sold the Emma Claudina and acquired the brigantine Lurline, which more than doubled the former vessel's carrying capacity. As the Matson fleet expanded, new vessels introduced some dramatic maritime innovations. The bark Rhoderick Dhu was the first ship to have a cold storage plant and electric lights. The first Matson steamship, the Enterprise, was the first offshore ship in the Pacific to burn oil instead of coal. Increased commerce brought a corresponding interest in Hawaii as a tourist attraction. The second Lurline, with accommodations for 51 passengers, joined the fleet in 1908. The 146-passenger ship S.S. Wilhelmina followed in 1910, rivaling the finest passenger ships serving the Atlantic routes. More steamships continued to join the fleet. When Captain Matson died in 1917 at 67, the Matson fleet comprised 14 of the largest, fastest and most modern ships in the Pacific passenger-freight service. When World War I broke out, most of the Matson fleet was requisitioned by the government as troopships and military cargo carriers. Other Matson vessels continued to serve Hawaii's needs throughout the war. After the war, Matson ships reverted to civilian duty and the steamers SSs Manulani and Manukai were added to the fleet - the largest freighters in the Pacific at that time. Immediately after the December 7, 1941 attack on Pearl Harbor, the passenger liners Lurline, Matsonia, Mariposa and Monterey, and 33 Matson freighters were called to military service. The four passenger liners completed a wartime total of 119 voyages, covered 1 1/2 million miles and carried a total of 736,000 troops. The post-war period for Matson was somewhat difficult. The expense of restoration work proved to be very costly and necessitated the sale of the Mariposa and Monterey, still in wartime gray. In 1948, the Lurline returned to service after a $20 million reconversion. Two new Matson hotels were built on Waikiki in the 1950s, the SurfRider in 1951 and the Princess Kaiulani in 1955. In 1955, Matson undertook a $60 million shipbuilding program which produced the South Pacific liners Mariposa and Monterey, and the rebuilt wartime Monterey was renamed Matsonia and entered the Pacific Coast - Hawaii service. In 1956, a research department was established and its first major assignment was to develop the most modern, efficient and economical means of transporting cargo to and from Hawaii. The result was Matson's freight containerization program, which revolutionized Pacific cargo carrying. In 1958, several C-3 freighters were adapted to carry containers on deck. In July 1959, the S.S. Hawaiian Citizen was converted into an all-container ship. In that same year, the Company divested itself of all non-shipping assets, including the Matson hotels, which were sold to Sheraton Corporation. When the Hawaiian Citizen entered service in April 1960, with a capacity for 436 24-foot containers, it was the first all-container carrier in the Pacific service. The fleet improvement program continued, with Matson freighters converted to combination container and bulk sugar or to container and automobile carriers. Two "jumboized" C-4s, the SSs Hawaiian Queen and Hawaiian Monarch, joined the fleet in late 1965 and early 1966. Each vessel was lengthened by adding a 110-foot midbody section. In the fall of 1967, Matson launched the first fully containerized freight service between the Pacific Coast and the Far East. A major ship construction program was undertaken in the late 1960s. When the Hawaiian Enterprise (now named Manukai) entered service in March 1970, it carried a record load of 1,165 containers and clipped more than a day from the regular 5 1/2 day run from the mainland to Hawaii. Also in 1970, in line with the decision to concentrate on its Pacific Coast-Hawaii freight service, the Company sold its passenger vessels and suspended its Far East service. With the focus sharpened, the Company concentrated its efforts on developing a fleet of the finest containerships in the Pacific Coast - Hawaii service and on modernizing and otherwise improving terminal operations. This effort resulted in the construction of the containerships Manulani, Manukai, Maui, Kauai, and the ro-ro vessels Lurline and Matsonia. In 1985, two unique container barges, the Haleakala and Mauna Loa, were introduced to Matson's Neighbor Island fleet. In 1989 and 1990, Matson acquired the ro-ro vessels Kaimoku and Kainalu and were introduced to the company's Hawaii Service. In 1991, the ro-ro Neighbor Island barge, Waialeale, was constructed and added to Matson's Neighbor Island Service. The diesel-powered containership MV R. J. Pfeiffer was added to the fleet in 1992. The R. J. Pfeiffer was Matson's first long-haul diesel-powered ship and is equipped with sophisticated automated systems. These features provide approximately 35-percent greater fuel efficiency and permit the ship to operate with a smaller crew, making it the most efficient vessel in Matson's fleet for its time. In 1987, Matson formed Matson Intermodal System, Inc., an intermodal marketing company which arranges North American rail and truck transportation for shippers and carriers. In July 1994, Matson launched a Pacific Coast Service, which provides weekly service between Los Angeles and the Pacific Northwest ports of Seattle and Vancouver, B.C. The service was restructured in 2000 from a weekly port-to-port service to a twice-weekly container rail service operated by Matson Intermodal System and Burlington Northern Santa Fe Railway Company. In February 1996, Matson and APL inaugurated a 10-year alliance agreement which allowed both carriers to cost effectively serve their respective markets; for Matson, this involved the domestic trade of Guam - Micronesia and for APL, international ports in the Far East. The most prominent aspect of the agreement for Matson involved the purchase of six APL container ships and certain APL-owned assets in Guam for $164 million. The agreement was revised in January 1998; for Matson, the primary benefit of the revised agreement involved the establishment of a direct service from the U.S. Mainland to Guam, reducing transit time from 13 to 10 days. In 1998, Matson formed Matson Logistics Solutions, Inc., to provide supply and distribution services to Matson customers, including management of transportation purchases, inventory and on-time deliveries. It also handles special projects, including moves for unusual cargo, construction projects, and film production units. Also in 1998, Matson entered into a joint venture with Sea-Barge Line, Inc., Saltchuk and Puerto Rican investors involving the deployment of two Matson combination roll-on, roll-off/lift-on, lift-off containerships (SSs Kaimoku, Kainalu) in a service between Florida and Puerto Rico. The agreement resulted in the formation of Sea Star Line. Castle & Cooke was founded in 1851 as a partnership between Samuel Northrup Castle and Amos Starr Cooke as a department store that sold farm tools, sewing equipment, and medicine. Joseph Ballard Atherton joined as clerk in 1858 and rose to become partner by 1865. Over the next few decades, the company invested heavily in Hawaii's surging sugar industry, running plantations in Kohala and Haiku. Atherton became president after the deaths of Cooke in 1871 and Castle in 1894, when the company incorporated. After the death of Atherton, George Parmele Castle (1851–1932) became president. G.P. Castle retired in 1916 and Edward Davies Tenney became chairman. In the 1910s, the company, along with three other Big Five companies, invested in Matson Navigation Company. Tenney became president of Matson after William Matson' death. In 1931, the company also bought a 21 percent share of the Hawaiian Pineapple Company, which was later renamed the Dole Food Company. After the death of Tenney, Alexander G. Budge became president in 1935. Castle & Cooke bought the remaining shares of Dole in 1961. Between 1964 and 1968, Castle & Cooke acquired the Standard Fruit Company, adding bananas and other tropical fruits to its existing pineapple operations. In 1976, it acquired Bud Antle Inc., a California-based lettuce and celery farmer; it was renamed Dole Fresh Vegetables in 1989. The company maintained Dole's large pineapple plantations throughout the state, including a particularly large one on the island of Lanai, where Castle & Cooke owned about 95 percent of the island. In the decades that followed, Castle & Cooke began to face severe financial trouble as Hawaii's agriculture industry weakened. In 1985, the company merged with the Flexi-Van Corporation, a transportation leasing company. In 1991, the company was renamed Dole Food Company. In 1995, the real estate operations of The Dole Food Company were spun off as the newly reformed company Castle & Cooke. The new Castle & Cooke was bought by Dole CEO, David H. Murdock, who remains the CEO of Castle & Cooke today. 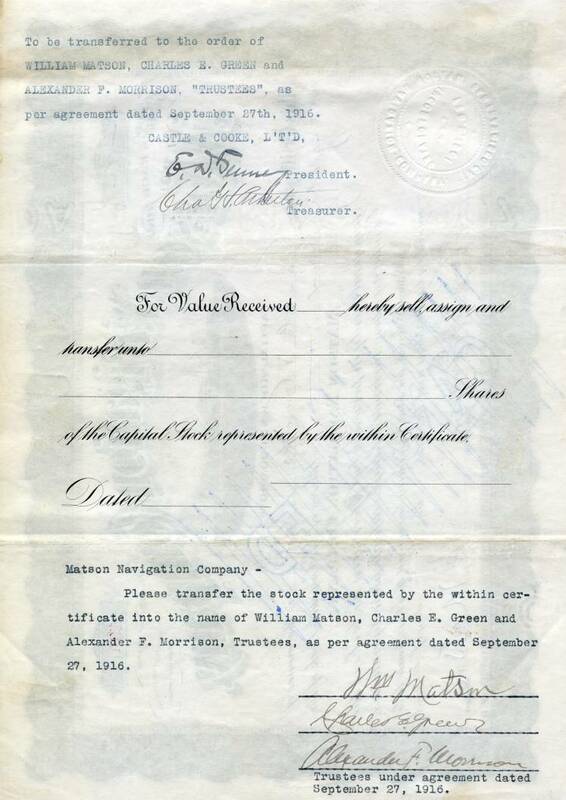 The above history is from the Matson Corporation website, Wikipedia and OldCompany.com (old stock certificate research service).